and would like to have you included in this festive event! The parade is slated for Saturday, December 21, 2018 at 10:00 a.m. 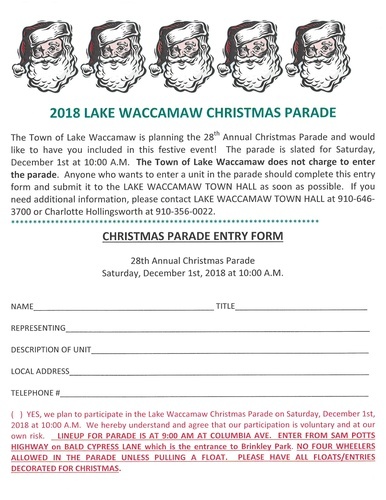 The Town of Lake Waccamaw does not charge to enter the parade. Fill out entry form and submit to the Lake Waccamaw Town Hall as soon as possible. Call the town hall at 646-3700 or Charlotte Hollingsworth at 910-356-0022.